Welcome to Jumpmasters Trampoline Park, where everyone gets AIRBORNE. We have over 14,000 square feet of an indoor adventure park. Jumpmasters OBX is the ONLY trampoline park on the beach. We are much more than trampolines (even though they are awesome) Our park is fun for all ages, it has something for everyone: dodgeball, ninja warrior course, foam pits, battle beam, climbing wall and so much more. Get your adrenaline pumping and your face grinning from ear to ear. Jumpmasters OBX is a veteran-owned independent trampoline park disguising heart-healthy fitness as fun for the whole family. Bring out your competitive side in a game of dodgeball, or a war on the battle beam, young and old, there is something for everyone at Jumpmasters. We specialize in birthday parties; let us do the work, while you enjoy the party. We offer fitness classes, toddler time, camps, Drop & Shop, tumbling classes and team building courses. Large groups? No problem, we offer group rates, and meal packages to accommodate your groups. Want to rent the entire park? We do private rentals as well, we here to make your visit the absolute BEST DAY EVER. Brent Johnson is a retired Major in the U.S. Army. The name "Jumpmasters", has a very real connection to Johnson - he is a certified Army jumpmaster. 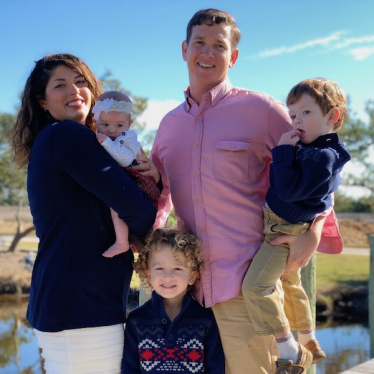 Brent and his wife Lauren are excited to have something that families can enjoy year-round on the Outer Banks.